I should be saving my money, not spending it on more pens and pen stuff. In spite of that, I just received a Nock and Co. pen case– Sinclair in peacock and coal. I also threw in a Pilot Metropolitan Retro Pop in turquoise with a medium nib. I got medium because I tend to prefer a fine nib, and wanted to branch out. 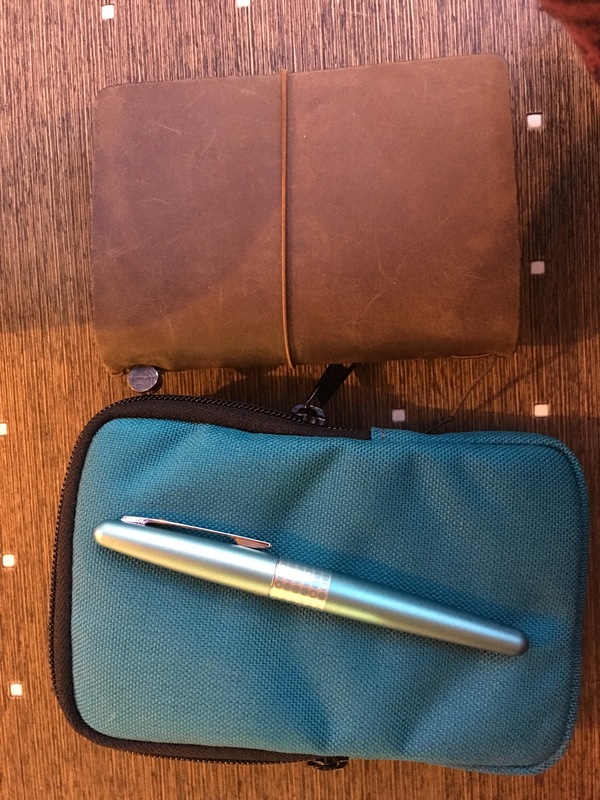 The case is sturdy canvas and has three pen slots, space for this and that, and a pocket for a small notebook. I’m actually keeping three fountain pens, a blackwing pencil (sharpened- the full sized pencil would be too long) and a cross ballpoint pen in the pen slots, so it’s quite roomy. You can see the overall size as compared to my passport sized Travelers Notebook. The pen was only $15, but it writes very well- I’m pleasantly surprised. The nib is too broad for me to use everyday, but it’s nice for the more decorative writing I’ve been experimenting with. Right now it’s filled with Noodler’s General of the Armies, which is a thick green with black undertones. These are both going to travel with me every day. I’ve been working on my “lettering”. Lately I’ve been using a Lamy Joy Calligraphy pen with a 1.9mm nib. It came with a dark blue ink cartridge, which I usedfor practice. The pen started skipping terribly, and I thought it was going to be a bust. I decided to fill it with a wetter ink and see if that would help. It did. Once I had changed the ink it was much smoother and I haven’t had any more problems with it. I’m not really a Lamy fan, which seems to put me in a minority. That said, this pen does the job admirably. I like the way it looks –long and slim, with a shape reminiscent of a classic dip pen. It’s too long for my pen case, but I can overlook that. I recently imported my other blog to this one and then deleted it. Many of the images seem to have failed to transfer (but not all, which is weird). Anyway, I’m going to try and restore them, but it’ll take a while. My new favorite inks are from Noodlers–I will admit that I resisted trying them for a while because I don’t like the bottles. Such a shallow snob, I know. 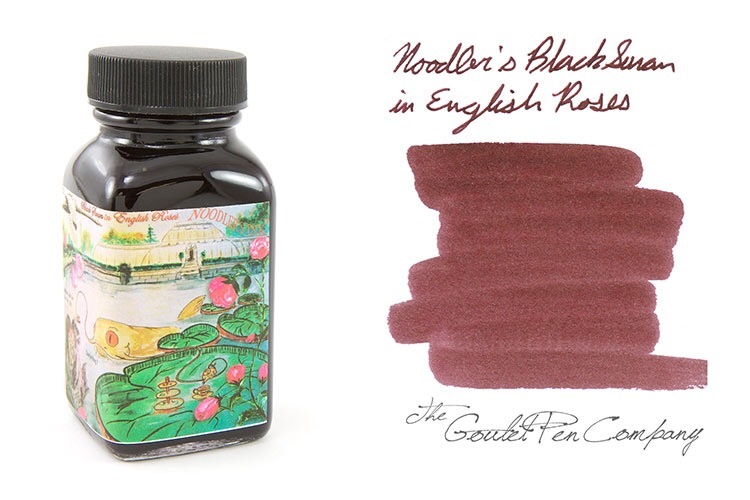 Anyway, I ordered a few ink samples from the Goulet Pen Company and included a sample of Noodlers Black Swan English Roses because I liked the name. I’m not a fan of writing with red ink because it has certain connotations for me, but I had to try it. I LOVE THIS INK! It’s a beautiful brownish red that looks a bit like blood in certain kinds of light. It’s really pretty and so smooth. I’ve been filling my TWSBI Diamond 580 with it and it’s started to be my go-to. My other regular use pen – the TWSBI Mini is filled with Noodler’s Zhivago (but that’s a subject for another post), and I use them both almost exclusively these days. I guess that the moral of this story is two-fold: Don’t judge an ink by its bottle, and Don’t knock it until you try it. The Diamond Mini and the Diamond 580 are piston fillers, which I really love. They hold so much ink! The Vac Mini is a vacuum filler. I really wanted to love it, too, but I don’t. It holds as much ink as the other two pens but, while I LOVE the fine nib, I don’t like how much condensation there is in the end of the pen and I don’t like that I have to twist it open every time I want to write. That, unfortunately, is one of the features of a vacuum pen! I guess that means that it just isn’t for me. I’ve been trying to figure out the advantage of a vacuum filler over a piston filler, and the only one I can really come up with is that a vacuum filler can withstand changes in pressure without leaking better than a piston filler. That is important for people who fly a great deal, but not really a concern for me (more’s the pity). I’m glad I tried the vac mini, but my go-to is shaking out to be the mini classic. My other recent purchase is a Midori Traveler’s Notebook (passport size), and I L-O-V-E it! It’s so cute, and so stashable, and yet so usable! It comes with a little cotton bag that protects the leather from wear. Mine also came with an unlined Midori refill notebook. I purchased two additional grid notebooks and a pocket insert. It’s really easy to swap out refills. Midori notebook paper is really nice to write on if you’re a fountain pen user–it’s smooth and doesn’t bleed through. Up until now I’ve been a Molskine fan, but I’m definitely converting to Midori! UPDATE (2016-11-21): I continued to have issues with the mini-vac — the most serious of which was that, no matter how loosely I tightened the end, it would always be so tight that I couldn’t unscrew it when I wanted to write. I was getting pretty frustrated with it and then the end of the cap snapped off without warning! I’m not sure what to do with it now. I cleaned it and put it on a shelf to think about later. I wonder if I just got a 🍋? I have lately been salivating over the gorgeous color range available from Pilot and Levenger. I don’t like to write with plain blue or black –so boring! On the other hand, I don’t want everything I write to look like the i’s should be dotted with hearts and smiley faces. It’s a delicate balance. 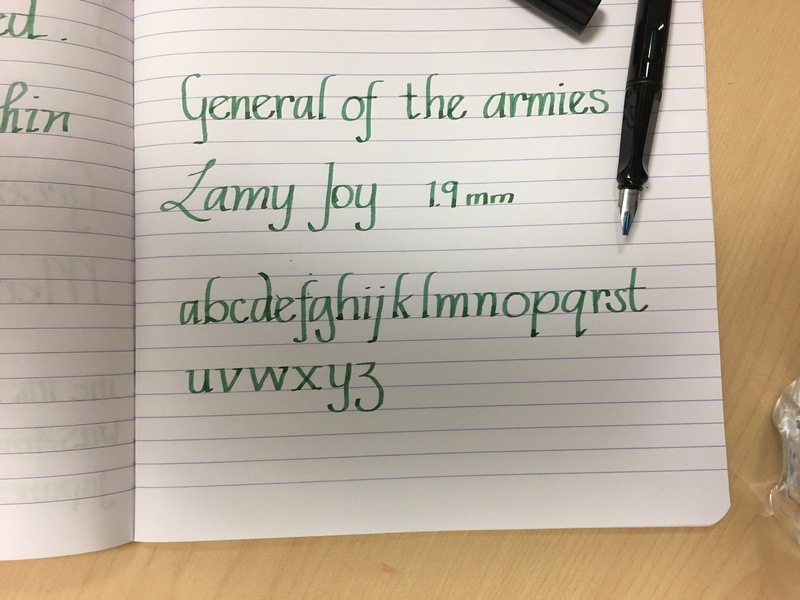 I love green ink, but it always seems too dry. I’ve written with Waterman Brown for years, but in the last couple of months I’ve had my eyes peeled for a nice grey. I don’t want it to be too light, but it shouldn’t be too dark, either. I ordered a bottle of Levenger Greystoke–partly because of the color, but partly because of the name. Is this the color you’d write with if you were shipwrecked off the coast of Africa? In the end I loved the way the ink performed in my pen — it’s nice and wet and is very smooth. It’s too dark, though. Almost black. Next I ordered a bottle of the iroshizuku fuyu-syogun by Pilot. The only other color of that brand I had tried was a yellow-green bamboo color. It’s nice ink, but the color was too light and too yellow. Would the grey be the same? In the end, the color was perfect. Decidedly grey, but dark enough to be professional. It feeds well in my pen and makes me very happy. Now I’m looking for my next must-have color. Will it ever end?! I love pens, and paper, and all the paraphernalia that goes with them. I’m particularly enamoured of fountain pens, and I’ve had quite a few in my time. Lately I’ve become interested piston fill pens. I’ve purchased two that are considered good mid-price pens. The TWSBI Diamond 580 with a fine nib and the Lamy 2000, also with a fine nib. My picture below is a little confusing. The Lamy is the black pen and the TWSBI is the demonstrator. I really love the TWSBI, but the Lamy 2000 skips a bit and doesn’t feed very well. I have a large collection of bottled ink, but I’ve been enjoying the Pilot Nimiki Iroshizuku and Levenger brands. I plan to write more here about my pen love in future. Stay tuned. It’s a rainy Friday here in San Jose, and I’m thinking about spring and tea parties–even mad ones!